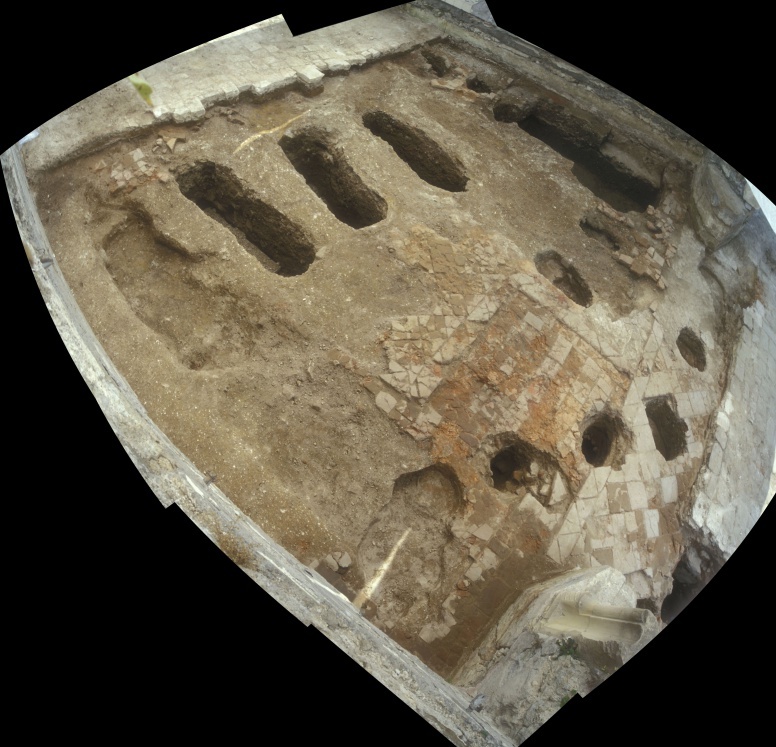 In 2002, the Institute of Archaeology carried out systematic archaeological investigations and conservation inside and around the monumental complex of the church. A detail of the ground plan of the sacred structure investigated in the western part of the sanctuary and in the north-eastern corner of the aisle provided information about its stratification. It was possible to prove the existence of the topmost church floor dating from the Baroque period. Beneath this layer the investigations uncovered a layer of yellow clay and a Gothic brick floor (24 x 24 cm). The remaining parts of the Gothic floor allowed a reconstruction of the pattern. 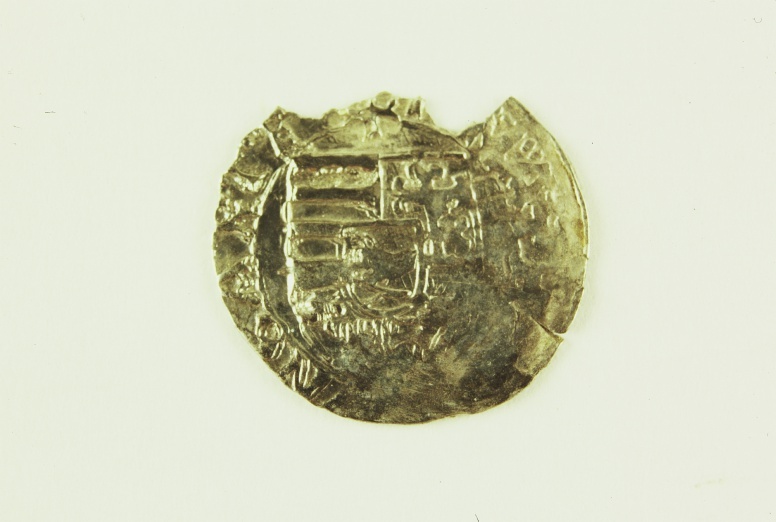 A particularly interesting find is the coin of Matthias Corvinus, the King of Hungary and Croatia (1458-1490), discovered in the layer immediately below the Gothic floor. A cluster of graves in the southern part of the church sanctuary contained children’s burials. Below the church floor lay a grey layer made when the working surface was leveled for the construction of the church. It yielded 14th and 15th-century pottery, a layer of burnt red earth and a black layer of char. Further, a layer of clay and river pebbles was discovered, below which lay a grey-green layer of alluvium with some charcoal. This layer of alluvium of the Voćinka river covered two cremation graves from the Late Bronze Age. The second investigation was carried out in 2008 in the eastern part of the monastic complex, in a room connected by a door only to the bell-tower. The most important find from this investigation is the mediaeval floor of the monastery, decorated with a rhombic motif. The Gothic floor consists of a compact layer of lime with small gravel, smoothed on top. The rhombi incised into that white smoothed surface were painted blue and red. Several stone profilations were discovered, which belonged to ribs and fragments of door jambs. Other finds included a wealth of mediaeval pottery and stove tiles, as well as modern-period glazed pottery from the Ottoman period. 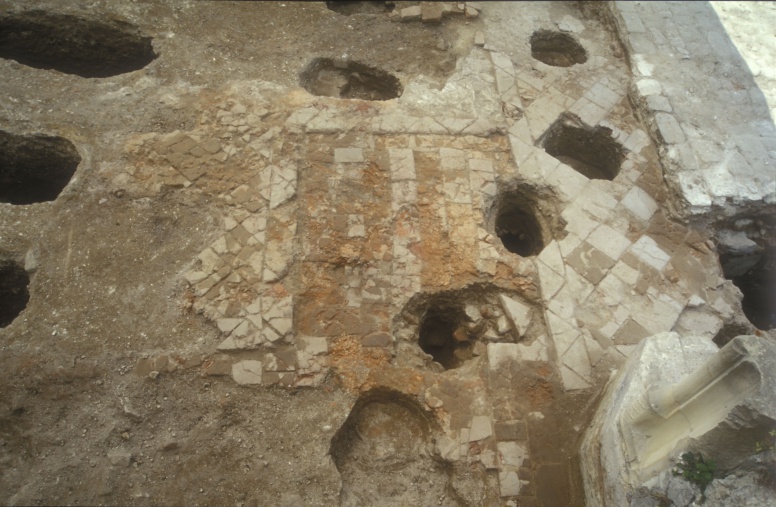 Below the clay bed of the floor there was a black layer with abundant charcoal and mediaeval pottery, below which lay a grey-green layer with charcoal, like the one encountered in the 2002 excavations in the church sanctuary. 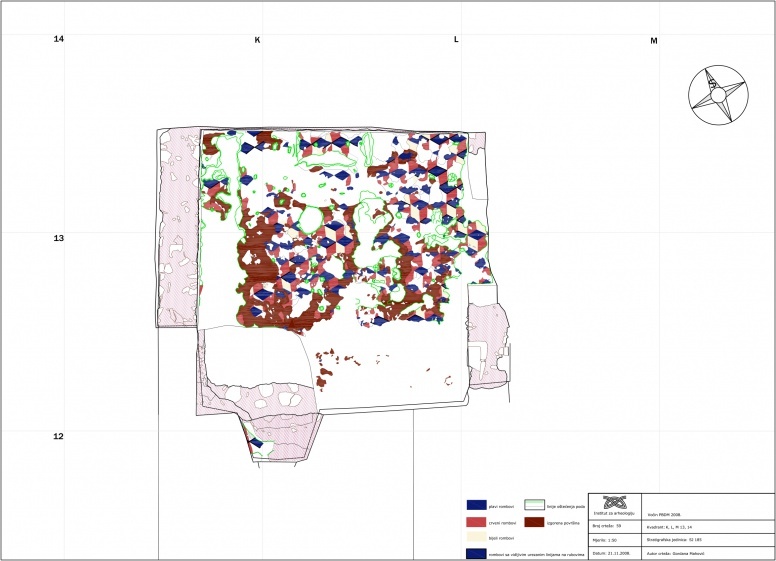 Jelinčić, K., Turkalj, K., Mahović, G., Pavličić, M. 2009, Voćin - crkva Pohođenja Blažene Djevice Marije, Annales Instituti archaeologici, V, 54–57. Tomičić, Ž. 2004, Obnova uspomene. Prinos arheologije obnavljanju župne crkve Pohoda Blažene Djevice Marije u Voćinu, Gazophylacium, 3-4, 65–79. Tomičić, Ž., 2011, Arheološki nalazi uz crkvu BDM u Voćinu in: Ulomci voćinske sakralne baštine, Požeška biskupija, Požega, 13–18.